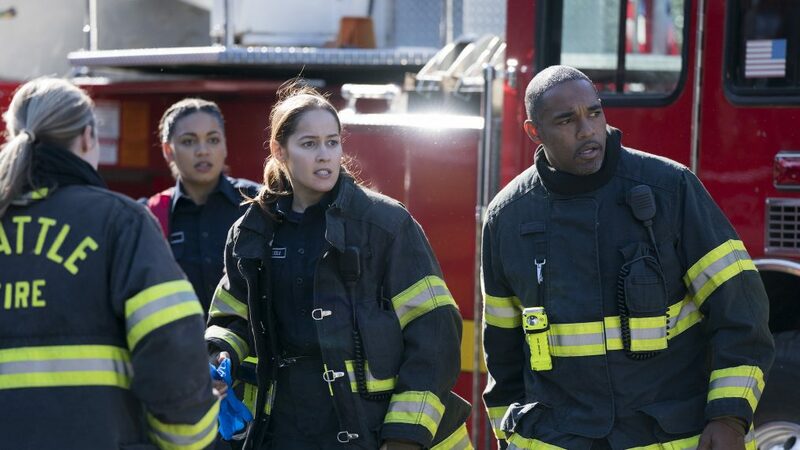 The Season 1 finale of new Grey's Anatomy spinoff Station 19 left almost every character in the firefighter drama in a life or death situation. The second season of the ABC series will almost certainly answer all your burning questions but stars Jaina Lee Ortiz and Jason George are keeping tight-lipped about the new episodes. However, they do hope Season 2 picks up exactly where we last ended off in the finale. "I can't imagine it not being a direct pickup from where we left off last season," Ortiz, who plays Andrea Herrera, told TV Insider on Thursday at the 2018 ATX Television Festival red carpet in Austin, Texas. The celebrity themed episodes return June 10. "It has to because there were too many cliffhangers It was so intense, I feel like to not show what happens each moment isn't fair," she added. During the Station 19 panel, show creator Stacy McKee teased about the characters that "anyone could die at any time." And if they're taking a page out of Grey's, we know that's very true. "There will be the same amount of heart and humor and action, plus way more. Now we’ve met the characters… we can dig even deeper," she added about Season 2. And there will "definitely" be bore interaction with Grey's characters! So, which other Shondaland characters would Ortiz and George (who plays Ben Warren) want to see on their set? "I'd like to see some characters from Grey's date some characters from Station 19," Ortiz said with a smile. George added, "I would love to see Jesse [Williams who plays Jackson Avery] or Justin [Chambers who plays Alex Karev] come over." And when Grey's finally does end — hopefully in the distant future — Station 19 wants to be a part of it. "Maybe not the series finale, but the penultimate [episode]," reasoned Ortiz. "The [two shows] have to fuse because this world already exists because of Grey's so why not!"